The numbers are in for how many consumers are spending their hard-end on 3D TVs and it seems that take-up has been a little on the slow side. According to retails analyst GfK 25,000 flat-screens capable of showing 3D were sold by the end of May, which isn't that impressive but you have to remember that it is only the first month that these sets have been on sale. When you look at the figure against that 252 million TVs which are set to be sold this year worldwide and it does look fairly meagre, though. The figures were presented at GfK's annual Consumer Electronic Conference who noted that "almost every notable manufacturer" is offering 3D in some way. If the Consumer Electronics Association has anything to do with it, though, it does seem that gamers will soon be swapping 2D for 3D. 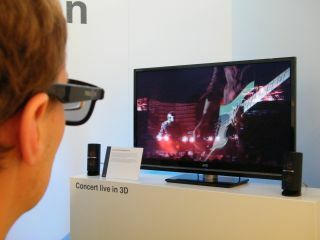 A study has shown that two-thirds (64 percent) of those who are interested in buying a 3D TV are games enthusiasts, with 27 per cent saying they will buy a 3D-capable display within a year. "Like with 3DTV, HDTV and other innovative technologies, consumers will need to experience a 3D video game to truly appreciate the experience," explained Ben Arnold, CEA's senior research analyst. "Manufacturers, retailers and game publishers will have to partner to offer more demonstrations and consumer education so prospective buyers can experience gameplay and other features of a 3D gaming device." Sony revealed at this year's E3 expo the first 3D titles which will be released on the PS3.